Soldiers at a British Army barracks in Aldershot say they have been living without reliable hot water and heating for almost a year. One soldier told the BBC that conditions at Keogh Barracks are "worse than those on the frontline". It highlights a wider problem as the Ministry of Defence struggles to find the money to maintain its vast estate. Yesterday a defence minister admitted "we need more money" to carry out maintenance and repairs. 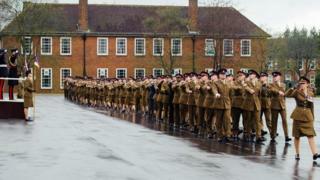 More than a hundred soldiers live in Keogh Barracks on the Aldershot base. The BBC has seen letters sent by some to their commanding officer complaining about the conditions they've had to endure. One says "I've never had a hot shower in my block". Another says "the block and rooms are freezing", while several warn of "low morale". The BBC has also spoken to two soldiers who live on the base and came to us to voice their frustrations. We have used aliases to protect their identity. Susan told us she'd served on the frontline in Afghanistan living in a tent and she said even that has "better facilities to wash and shower" than her barracks in Aldershot. "Being back in the UK", she said, "with no hot water and heating is just a disgrace". Janet says: "Prisoners get treated better than us and we've committed no crime". She says hot water and heating should be "a basic human right". Susan says she has to maintain vehicles "working with oils and lubricants" but then is often expected to clean herself in a cold shower. "I just feel grotty", she told us. Janet says not being able to wash properly is "unhygienic and all-round depressing". Soldiers say they've also had to buy their own heaters to keep themselves warm in their room. Morale at the base is described as low. Janet told the BBC that she has thought of leaving the Army because she believes they are not being listened to. She said: "We've lost some good soldiers recently through lack of morale and we feel just a lack of worth really. We don't feel we are really valued or cared about". The soldiers believe the problem stems from a burst pipe that has not been repaired. As a temporary solution, the Army has paid the private contractor who maintains the barracks, Carillion Amey, to install generators to provide heating and hot water. However, the soldiers said the generators regularly ran out of fuel leaving them without hot water and heating for days at a time. The MoD insists soldiers still have access to hot water in the mornings and evenings. The Defence Minister, Tobias Ellwood, acknowledged the MoD was struggling to maintain some of its military barracks. Giving evidence to MPs on the Commons Defence Select Committee, Mr Ellwood made a candid admission that the MoD "needs more money" to keep up repairs. A 2017 Armed Forces Continuous Attitude Survey showed a 4% decline in satisfaction with the overall stands of Service accommodation, with just under half (49%) of military personnel saying they're satisfied with their housing. In a report published in November 2016, the National Audit Office (NAO) warned the Department faced a "huge challenge in maintaining its estate", and had only been able to carry out "essential maintenance" since 2009. The NAO estimates there's an £8.5 billion funding gap for refurbishing barracks and managing the MOD's estate over the next 30 years.